I have made melt-in-your mouth Snowball Cookies before but that was 3 years ago. 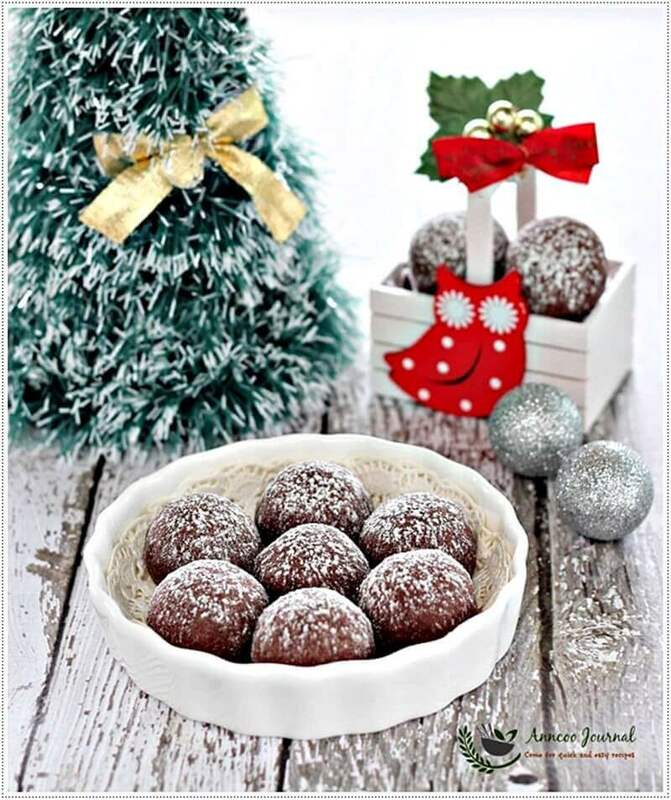 So this time, I tried to make this shortbread Chocolate Snowball Cookies. They are not very sweet and so easy to make especially when you have kids who like to hang around, help and enjoy making them with you. 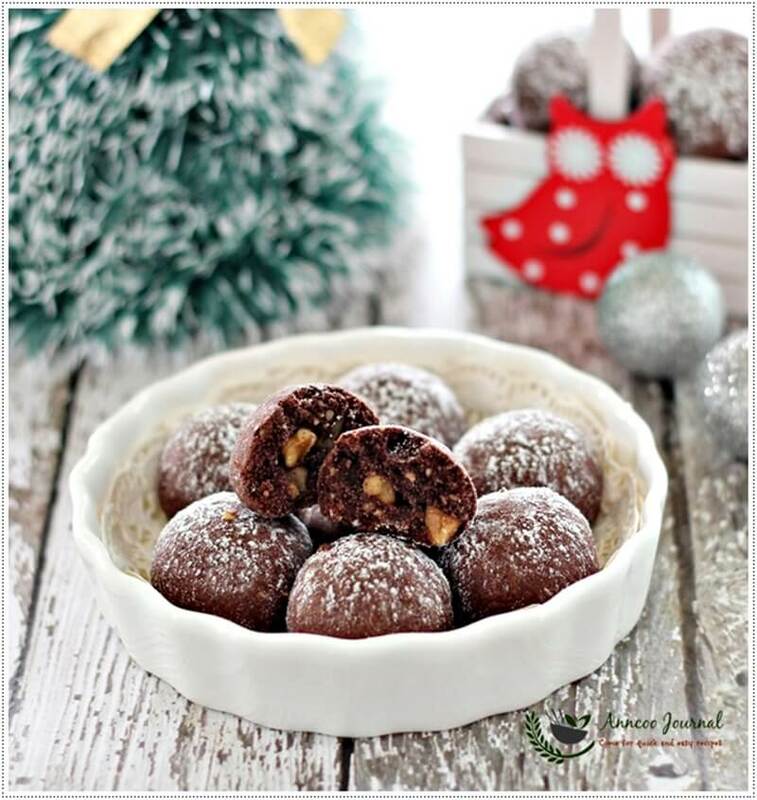 They are extra yummy due to the cocoa fragrance and added crunch from the walnuts. If you prefer, you can add in some chocolate chips. 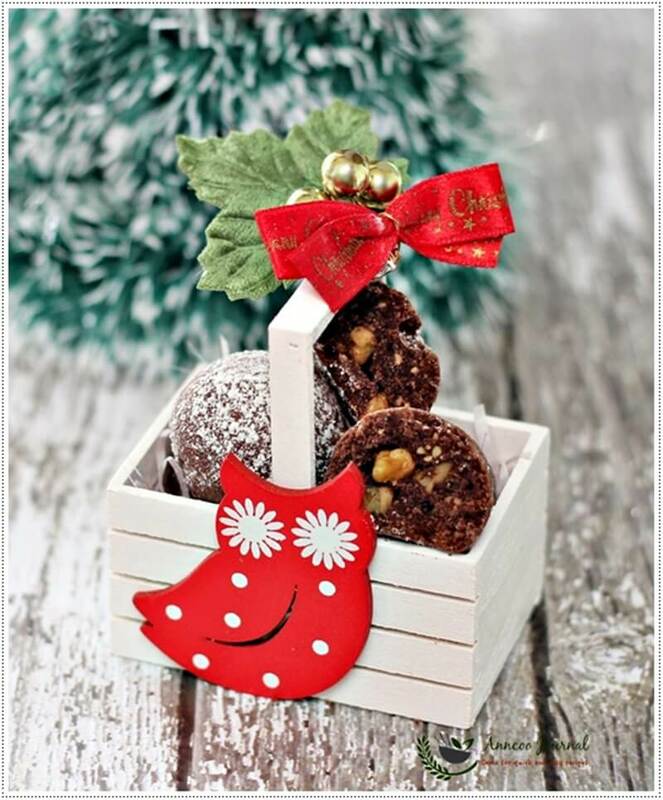 Not only do they look nice and unique but will also serve as a perfect gift for Christmas too. Wishing everyone of you a Merry Christmas and a very Happy New Year! In a mixing bowl, stir the soft butter to light. Add icing sugar and mix well and add egg yolk, mix well again. Sieve in flour ingredients and cocoa powder, add almond meal, fold well with a rubber spatula. Lastly add in chopped walnuts and mix well to form a soft dough. Cool down cookies completely and dust some icing sugar over it. organised by Yen from Eat your heart out, Diana from Domestic Goddess Wannabe and Zoe from Bake for Happy Kids. Can I use other nuts other than walnut? Yes, you can use any type of nuts you want. Thanks a lot, Ann! I don’t know where to get vanilla powder, Can I replace or omit it? Thank you! Hi Mickey, You can use vanilla extract too or just omit it. Simple and yet lovely! Love these cookies. Merry Christmas & A Happy New Year Ann! Thank you for always sharing the recipes with us. This is so Christmasy, Ann! Love it! thank you for sharing all your wonderful posts for the year. Have a good break and happy holidays! 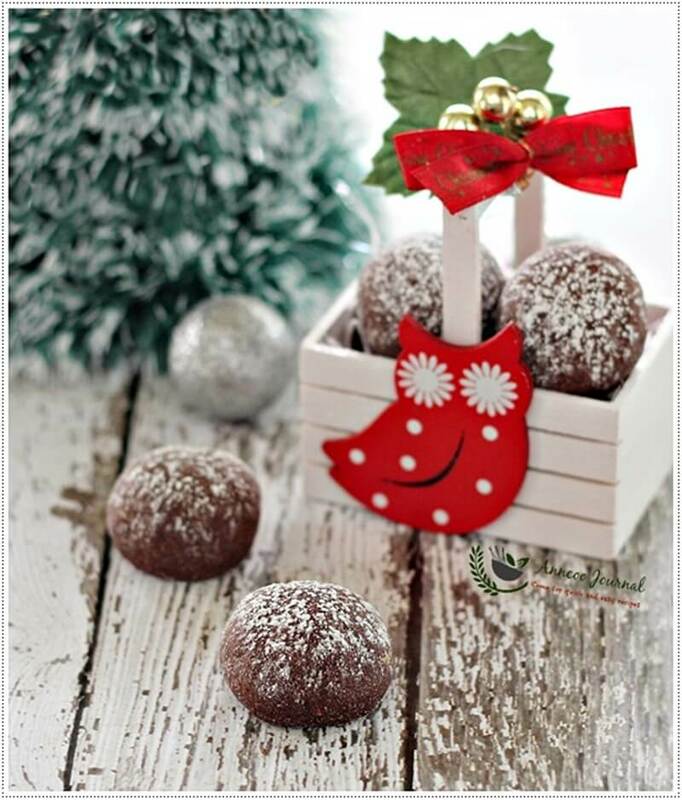 Love these snowy Christmasy looking cookies, a blessed Christmas to you Ann! HI !! !,long time havent visited your space. these look delicious. Thank you so much for leaving us with these lovely cookies, Ann. I'm sure Santa will have his full of delight nibbling at these:) It's always so nice when the children want to share in the holiday baking. It's cookies like this that make them realize how fun it can be. Divine looking cookies! Who can resist such delightful chocolaty treat! These cookies are simply lovely!! Hi Ann, these cookies must be good, I'm keeping the recipe for CNY. Thanks for sharing. These cookies are so Christmasy! I love this! I'm dreaming of a white and snowy Christmas too… You know. We never get snow in Singapore and Australia at this time of the year. I guess these beautiful cookies will fix our craving for snowy views. 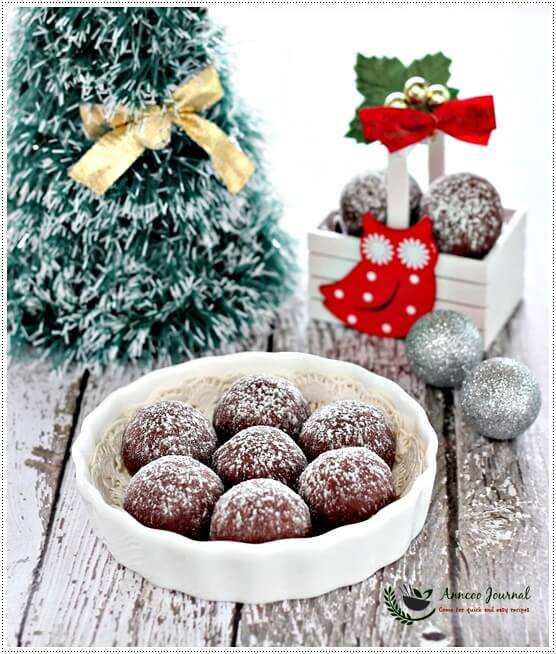 Hi Ann, these cutie pretty snowball cookies made me wanna countdown for Christmas! Blessed Christmas to you too ^-^! They do look cute and I love all the clicks! So christmasy and delicious! I would love a couple of them for my afternoon tea, Ann. Ann, these cookies and the setting really put me in the Christmas mood! Fantastic idea and delicious looking.